Memorial Sloan Kettering is located on the Upper East Side of Manhattan, in the heart of a thriving biomedical research corridor. We are part of one of the greatest concentrations of scientific and clinical expertise in the world — all found within just a few square blocks. 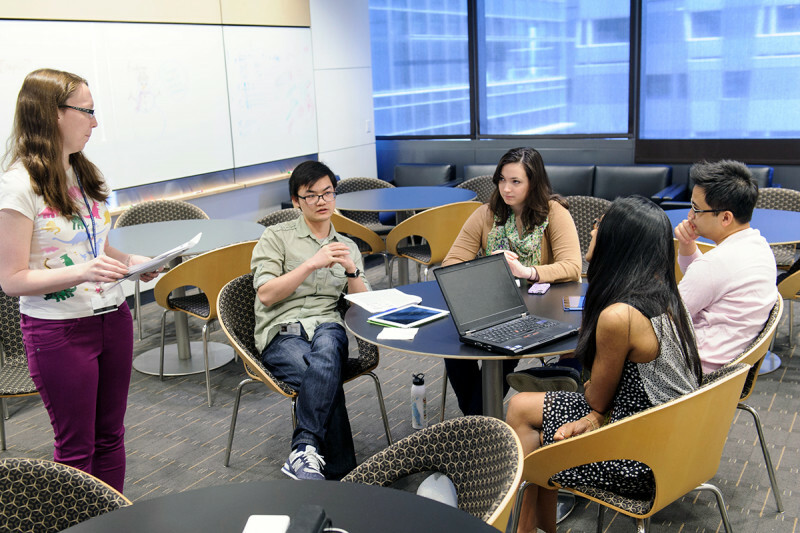 Because Memorial Sloan Kettering partners with Weill Cornell Medical College and The Rockefeller University in several joint graduate training programs, Gerstner Sloan Kettering students are members of an active community of graduate students, postdocs, medical students, and clinical fellows. Often the same laboratory is home to students from two or three different graduate programs, adding to the diversity of thought, opinion, and approach typically found at a cutting-edge research institution. In addition, our unique working relationship with neighboring research centers means that our students have access to a variety of facilities and resources beyond our own walls, including lecture series, symposia, and special events designed to stimulate dialogue among students, speakers, and faculty. With its vast academic, clinical, pharmaceutical, and financial resources, New York City is one of the most exhilarating places to live, work, and prepare for a future at the leading edge of scientific research. We encourage students to take advantage of the city’s educational and biotechnology resources. The New York Academy of Sciences opens its doors to students for a wide range of events, and also sponsors the professional development programs of the Science Alliance. In addition, you can attend roundtables and workshops offered by the New York Biotechnology Association, a not-for-profit committed to the development of New York’s biotechnology industry. Scientific collaborations are common at Memorial Sloan Kettering and throughout New York City. The National Institutes of Health is currently funding the New York Consortium on Membrane Protein Structure, a collaboration that brings together structural biologists to explore sequence-structure relationships for human membrane proteins and study membrane proteins associated with diabetes and other metabolic diseases. In addition, New York–area charitable foundations contribute millions of dollars in grants annually to healthcare-related projects. For example, the Tri-Institutional Stem Cell Initiative – a collaborative program of Memorial Sloan Kettering, Weill Cornell Medical College, and The Rockefeller University – was established with a $50 million grant from The Starr Foundation. The initiative aims to improve the understanding of stem cells and their therapeutic potential. Memorial Sloan Kettering is also a founding member of the New York Genome Center, an independent, nonprofit organization created to leverage the collaborative resources of leading academic medical centers, research universities, and commercial organizations in the New York City area. The goal of the center, which was founded in 2010, is to transform medical research and clinical care in New York through the creation of what will become one of the largest genomics and bioinformatics facilities in North America. The list of New York City’s bioscience credentials is constantly growing. The city’s first major bioscience office park, the Alexandria Center for Life Science, provides office and laboratory space for pharmaceutical, biotechnology, and bioinformatics companies, as well as contract research organizations. Learn more about the region’s science and healthcare resources from the New York City Bioscience Initiative. Our campus is located near some of New York City’s best stores and restaurants. We are only a few blocks from Central Park, which offers miles of bicycling and running trails, tennis courts, skating rinks, outdoor concerts, and more. Our campus also borders the East River Park Promenade, which features a bicycling, running, and skating path with breathtaking views of the East River and the many bridges that connect Manhattan to Queens, the Bronx, and Brooklyn. The campus is in the vicinity of many famous museums as well: the Metropolitan Museum of Art, the Whitney Museum of American Art, the Guggenheim Museum, the Frick Collection, the Museum of the City of New York, and more. If not within walking distance, New York’s cultural, athletic, and entertainment resources are easily accessible using the city’s extensive public transportation system.